Honestly, I had no idea that this profession existed. I dreamt of medical school to become a forensic pathologist or continuing my studies in anthropology to become a physical anthropologist. After weighing the pros and cons of each profession and length of study, I decided against both careers. I was left knowing three things: I liked a laboratory setting, I loved anatomy, and my innate curiosity for wanting to know what happens to the body after [insert various scenarios here!]. 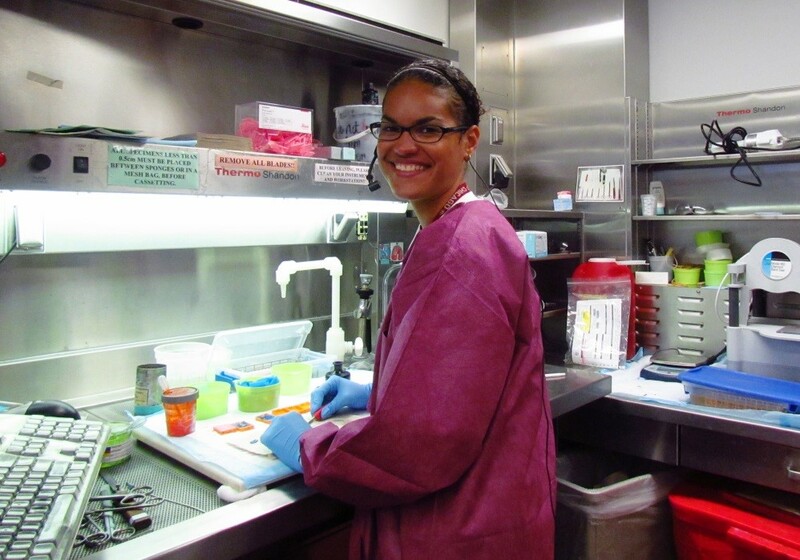 After doing some research and talking with the director of a clinical laboratory program in Chicago, my eyes were opened to the Pathologists’ Assistant profession. It was love at first sight and I immediately started on my path to becoming a PA. I found a job as an Anatomic Pathology Technician and after a couple of years and encouragement from the practicing PAs I worked with, I applied to RFUMS. Now, here I am, still in love with my profession and wanting to share it with anyone with the stomach to listen to what I do all day long! I really enjoy complex bone and soft tissue cases as well as head and neck. If you can handle these specimens, you can pretty much handle anything! Plus there is the added bonus of getting creative with liquid nitrogen and the different saws in the lab to get an awesome section. Lymph node dissections are also high on my list. It’s almost like workplace meditation; I go to my happy place, hum a little tune to myself and gently press away. It appeals to the side of me that likes to do puzzles, word finds/searches and is sort of like a hands-on pathology version of Where’s Waldo – Lymph Node edition. I have the opportunity to learn something every day due to the environment of my lab. I work at an academic institution and there are always people in and out of the lab such as vendors, environmental services, visitors/students, research investigators, IT, residents, surgeons/clinicians, etc. Each interaction is a chance to absorb a tidbit of information and to build relationships that better me as a person, a leader and a healthcare professional. Today was a very happy day at Cleveland Clinic! AAPA Places PA Day Ad in CAP Today! Check it out! AAPA has placed an ad in CAP Today in celebration of PA Day. Check out page 34 today! Help your office celebrate PA day with more resources on the PA Day webpage. Get your PA Day Logo Items! This year's crop of PA Day logo items are up again in the AAPA merchandise store! To see just the PA Day logo items click here. Looking for all AAPA merchandise, including regular logo items? Click here. 2016 PA Day is on its way! April 14, 2016 is Pathologists’ Assistant Day. This special day places a spotlight on our profession and the wonderful people who do this work every day. Download several new promotional banners, posters, and table tents to highlight the day at work. Take photos of your preparations for PA Day and share them with the hashtag #PADay! Visit the website today to check out all the fun. Share your story or a short statement on how PA Day is facilitated at your institution and what is being done to celebrate the profession. Post to the PA Day blog or simply Contact Us. We hope you will take an active role in using these materials as a means to educate others at your institution about the Pathologists’ Assistant profession. Please contact the marketing department of your institution to inquire about the possibility of placing an advertisement on your Intranet/web page, message boards, and screensavers, or in one of the hospital publications. This is a great opportunity to empower and celebrate our profession in the week leading up to and through Medical Laboratory Professionals Week, which is scheduled for April 20 - 24. 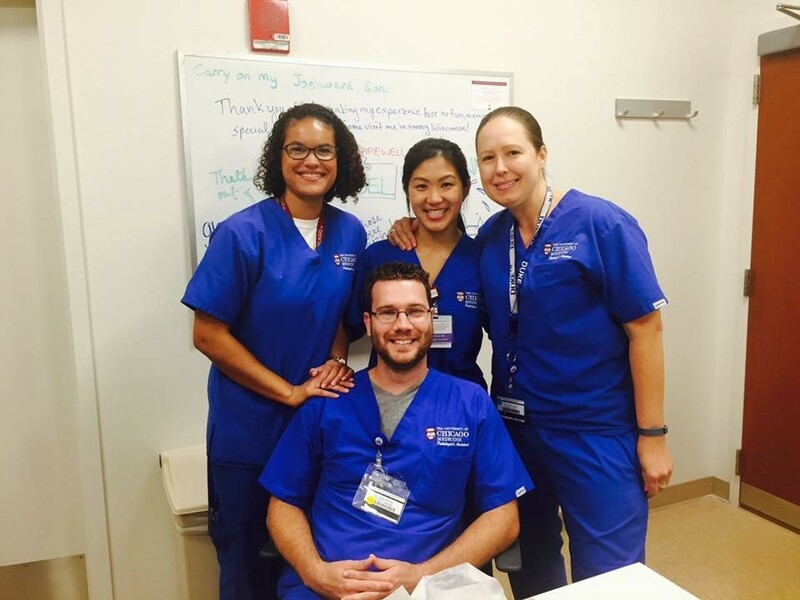 Each day you make a difference by providing quality patient care. We think you deserve to be recognized. Today is PA day! UCM celebrates! Today was a fun, smile filled day! I had a blast hanging streamers and blowing up balloons to celebrate our profession and my colleagues. Our lovely technicians also brought in donuts for a nice breakfast treat! 2015 PA Day - Let's Celebrate! Tuesday, April 14, 2015, is Pathologists’ Assistant Day. This special day places a spotlight on our profession and the wonderful people who do this work every day. This year brings several new ways to help our members celebrate! 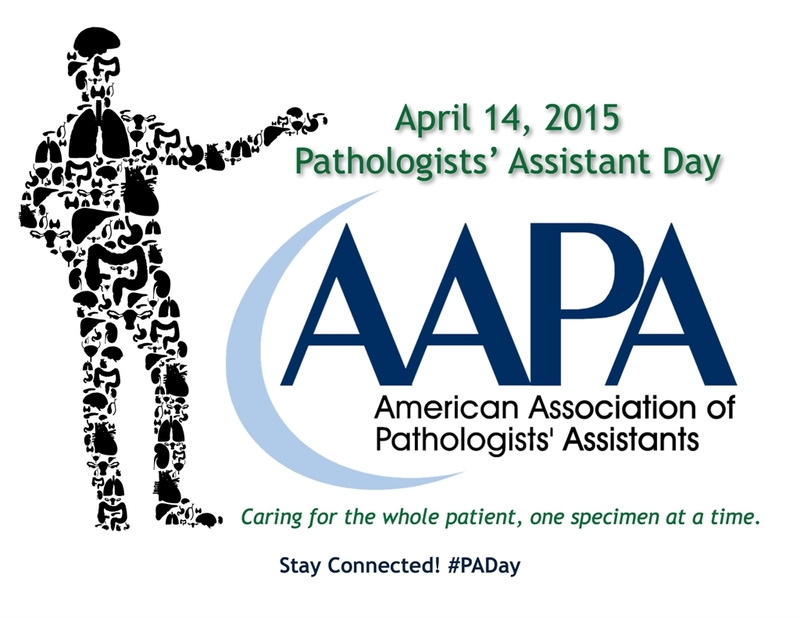 Download new promotional banners, posters, and table tents to highlight PA Day at work. Shop our newly designed PA Day logo items in the merchandise store including magnets, playing cards, luggage tags, mugs, chargers, and more! Our 2nd Annual Pathologists’ Assistant Day, April 14, 2015, is quickly approaching! Our designated day offers each of you a great way to promote yourselves and our profession within each of your workplaces. Furthermore, this is a chance to celebrate the important impact our hard work and professional skills have on quality patient care at healthcare institutions throughout the country. Moving forward we encourage you to advertise Pathologists’ Assistant Day by spreading the word to your collaborating pathologists, supervisors, and hospital administration. The AAPA will offer multiple options to do this, including banners, paper tents, and additional merchandise, specific for PA Day, which can be found on the AAPA website. As we approach PA Day, please check the AAPA website often for updates and links to these various forms of advertisement. In addition, we’d also like to receive feedback on how you were celebrated. We would want to encourage you to send pictures, stories, or a short statement regarding how it was facilitated, and what was done at your institution to celebrate the profession. Finally, we will randomly choose a couple of submissions to be featured in an upcoming issue of our quarterly publication, The Cutting Edge. We will follow up with more information in the weeks ahead via the AAPA website and email blasts. Best wishes in the New Year, and thank you for all that you do! To be honest, I did nothing spread the word about PA day accept to mention it to my Histology co-workers. When I came into work this morning I found two homemade cakes, one decorated with the words " Happy PA day" and there was a banner on the lockers in the break room. They also left me a very nice card on my computer, that the whole Histology/Pathology (including the pathologist's) department signed, thanking me for doing my job well. It is just one of the blessings of having a great work environment and I am very fortunate to work and live where I do. Thanks for creating "Pathogist's Assistant Day", it is always nice to feel appreciated. St Lukes Magic Valley Medical Center, Twin Falls ID. AAPA Pathologists' Assistant Day Coming Soon! Our first annual Pathologists’ Assistant Day on April 14th is fast approaching. If you have not yet had an opportunity to spread the word at your institution, you still have time! Visit our website’s PA Day networking page. Pictures of your celebration on April 14th. Various sized PA Day banner ads for promotion of this day. Additionally, please keep your eyes peeled for a special mailing coming to your doorstep soon.